Striding Edge, Jack's Rake, Swirral Edge, The Climber's Traverse on Napes Needle, Great Gully, Sharp Edge; truly names to conjur with that evoke the best of Lakeland Adventure. Try out this all new Adventure Cafe scrambling weekend that will see you breaking with the past, and experimenting into the twilight zone between walking and climbing. Enjoy the exposure, and the involvement that getting 'hands on' rock brings. If you've tackled some of the UK's classic mountain walking routes, maybe it's about time you made the transition to the next stage - scrambling. Taking on routes that will see you moving towards a more involving style of experience - in the transition towards climbing, you will find yourself completely absorbed in the essence of the mountain. Searching for the next move, finding good handhold, checking rocks for their safety, and enjoying the stunning and dramatic views over tumbling precipices - and most importantly - testing your nerve, and finding your physical limits - that's what a weekend of adventure is all about! Day 1 - Meet in Ambleside for the weekend. We shall use this pretty and welcoming Lake District village as our base for these three days of adventure. Each morning we shall travel out to our venue for the day. Your leader will brief you each evening on the following day's adventure. Day 2 - Early morning meet with leader (around 08:00) - and transfer to start of trek/scramble. Leader briefing, route briefing, and then off - into the fantastic Lakeland Fells! 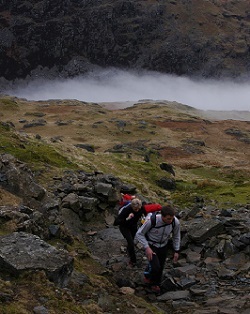 Return down from fells around 4/5pm - in time for tea and cake, and return to Ambleside for pub dinner. Suggested Day 1 in Langdale Area / Helvellyn Area / Blencathra Area. Day 3 - Select a second option from the above list - to complement yesterday's adventure. Leader will assess group's skills, and look at progressing in light of progress made! Possible to combine 2 scrambles, to make one long day! Once again return to base for dinner. Day 4 - Morning - (optional) - to incorporate morning climbing session - location tbc - within short drive. Note - harness, helmet, and rope and climbing hardwear will be provided (just bring walking boots / climbing shoes / approach shoes & normal outdoors clothing). Select from either comfortable bunkhouse accommodation, or upgrade to B&B. Just let us know. Prices for this event are based upon using bunkhouse accommodation. What is a Level 3.5 Climbing Challenge Like? How Fit Do I need to be to join a Level 3.5 ‘Climbing Challenge’? Qualified, Experienced Leader, Group Equipment, Trip Notes, Outline Route Maps, 3 Nights Bunkhouse Accommodation, 3 Breakfasts, Climbing Equipment. Please note - this is an intense mountain experience. We shall be close to some big drops - but always with good footings, and safe handholds. Your leader will carry appropriate protection - rope, and slings to fashion temporary harnesses if required. 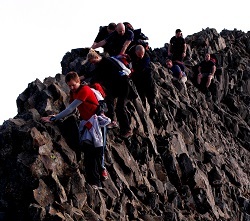 Your leader will be a qualified British Mountain Leader, with extensive scrambling experience. He or she will also be First Aid Qualified. Be prepared for the full spectrum of weather - we could have either summery hot weather (although it could still be cool on the tops even in 'fine' weather). We should be prepared for both cold, wet, and hot conditions! So pack sun protection, rain gear, and warm clothes!